Availability: long deleted by Argo/Decca; LP and CD available from The Yetties’ website. Click here. 2) when the concert finished, the studio was still free, so Daly got them to carry on recording – the end result was the Argo album ‘The World of Irish Dancing’, on which the studio caretaker gets shanghaied to play the piano and the assembled Yetties and pals pass themselves off as O’Dalaigh’s Ceili Band. Oh, Daly! It makes me smile each time I think about it. For info about the album, click here. 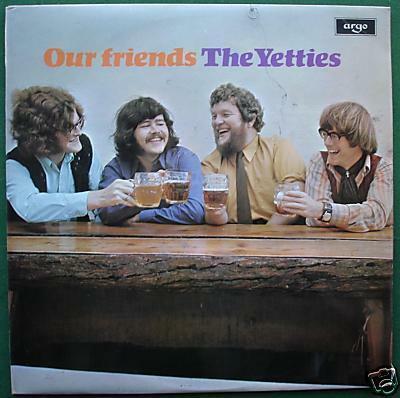 Alistair Banfield has kindly sent me the following information about the record labels that The Yetties first recorded on (Acorn and Zeus) before their move to Argo in 1970 (See post for ‘Keep a runnin’ – it’s The Yetties’ album). “Acorn and Zeus were in fact the same person. His name was Colin Sanders. He was well know for producing records on his home studio and would do the rounds particularly with theatre organ recordings (a coincidence given the link to the organ in the Yetties’ album – Keep a Runnin’). “He issued many records linked to Leon Rosselson (from whom I received info on the Acorn label). He eventually set up ‘Solid State Logic’ and began making his own machines (high end recording studio consoles). This proved to be far more lucrative than recording people so the studio packed up. Thanks to Alistair for the info and suggesting a connection between Sanders, Curtis, Daly and The Yetties. Now he’s told me, it’s probably more than a coincidence, the organ thing. It would be odd if Sanders (whose Acorn label was issuing LPs of Lancashire Wurlitzers in the early 1970s) didn’t know theatre organ fanatic Curtis (who had his own Compton in his shed in Bolton). If you want to check out the Solid State Logic blog (there’s a bit of history about how Sanders moved from studio producer to kit inventor), click here. Is this proper recording trivia, or what? ~ by folkcatalogue on April 28, 2010.